An adjustable height coffee table is an ideal solution for an urban dweller whose apartment is not spacious enough to accommodate both a coffee table and dining room table. These tables are also popular with people who vacation or live in yachts, sailboats, or RVs. They are often made of wood composite with metal accents and can even include storage space underneath for extra functionality. Some living arrangements call for the most compact, multi-purpose furniture you can find. An adjustable coffee table fits the bill. When you move into a studio apartment, you're faced with the monumental task of transforming a single room into an all-in-one living room, dining room, and bedroom. Accomplish this easily using an adjustable height coffee table plus a daybed, futon, sofa bed, or other space saving bedroom furniture. Familiarize yourself with other strategies for designing for small spaces as well. Some apartments don't include separate dining rooms. If the apartment's kitchen is also tiny, you might choose to incorporate the dining area into the living room instead of cramming it into the kitchen. An adjusting coffee table is ideal in this situation. Raise it when you need it to function as a dining table, and lower it when you want to use it as a coffee table. A pedestal table is a table supported by a leg or base at the center. Sometimes you can find pedestal tables with adjustable legs. Here are some examples from Hydra Designs. 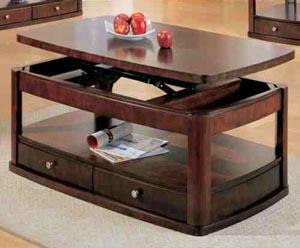 Some contemporary style coffee tables are height-adjustable where the legs cross each other. You can find a Mascotte dining and cocktail table at Jensen-Lewis.com. High-low tables are also known as hi-lo tables. These tables are typically used in both marine and medical care environments, but savvy urbanites have been known to re-purpose them for use in their living rooms. Hi-lo tables are available in a variety of configurations. Some of them are drop-leaf style tables; open them up when you need a dining room table, and close them when you want them out of the way. Adjust the height as necessary, depending on how you need to use the table. You can find high-low tables at Arrigoni Design. How much space do you need for dining and do you need storage space? If you're single and don't entertain much but do need extra storage space, you could use a lift top table. Do you need to be able to entertain a few more people, but don't have the free space to have a wide table in your home? You could consider a hi-lo table with drop leaves. Do you have plenty of storage space in other areas of your home? An adjustable base table could work for you and you won't be limited by options that have cabinets and drawers for miscellaneous items. If you have appropriate tools and know-how, you can make your own adjustable height coffee table. If not, you can commission someone else to custom-make an adjustable table to your specifications. Below are a couple of resources available if you'd like to purchase just a base or pop-up mechanism, and add your own tabletop. Kurt Petersen has a base to use for making your own adjustable pedestal style table.